An artist’s rendering of the London memorial. Courtesy of Adjaye Associates. The plan to erect a Holocaust memorial in London’s Victoria Tower Gardens next to the Houses of Parliament has moved forward with the selection of a design by a consortium of international firms including Adjaye Associates, Ron Arad Architects and the landscape architects Gustafson Porter + Bowman. 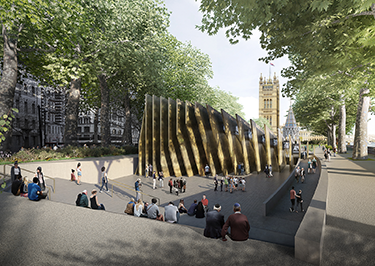 ​The design’s 23 vertical bronze fins require visitors to enter on 22 separate pathways—representing the 22 countries in which Jewish communities were destroyed—and to emerge opposite Parliament. To preserve the park’s green space, directly abutting the Thames River, the memorial will be located at the far southern end. “We wanted to create a living place, not just a monument to something of the past,” said Sir David Adjaye, the British-Ghanian lead architect of the project. ​But aspects of the plan itself, initiated in 2013 by David Cameron when he was prime minister, are controversial. The Imperial War Museum in London has called for a reconsideration of the memorial’s educational complex, slated to be housed underground, which museum officials worry might compete with its own Holocaust center. In addition, critics of the site argue that it is too small and prone to flooding, and that allowing construction there would set a precedent that could endanger other city parks. 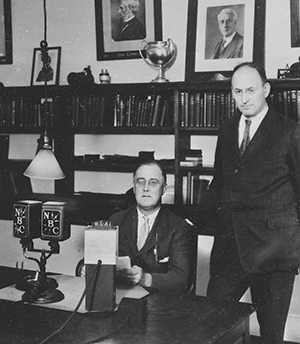 FDR (seated) with Treasury secretary Henry Morgenthau Jr. The question of whether President Franklin Delano Roosevelt and his administration did enough to save Jews during the Holocaust has long been a source of controversy. A trove of new material can now advance that debate. ​In April 2017, on Yom Hashoah, the Franklin D. Roosevelt Presidential Library in Hyde Park, N.Y., announced the launch of a years-long, $2.5 million digital project that will bring together 400 archival holdings, allowing scholars to easily cross-reference wartime narratives. “We don’t have the biggest Holocaust collection, but what we have is very important,” said Paul Sparrow, the library’s director. ​Highlights include the records of FDR’s War Refugee Board; the papers of Rudolf Vrba, a Czech Jew who penned one of the first personal accounts of the atrocities at Auschwitz in an attempt to alert the world; and the papers and diaries of Henry Morgenthau Jr., Roosevelt’s Treasury secretary and a major figure in the administration’s refugee policy. After years of studying fashion in Milan, Paris and London, followed by a stint in Israel, Dana Rogozinski returned to her hometown of Jacksonville, Fla., in 2017 armed with a new business plan—and an unusual Holocaust remembrance project. The granddaughter of two survivors, Rogozinski decided to use the jewelry-making expertise she had learned from her grandmother to launch J&E The Legacy Collection, named for her late grandfather, Jakob Rogozinski, and grandmother, Ella Lucak Rogozinski, an employee at Underwood’s jewelers in Jacksonville for almost 50 years. ​While living in Israel in 2016, Dana Rogozinski created her first piece. 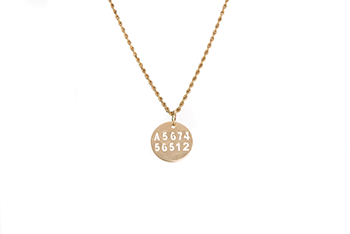 That design, a necklace, featured the numbers from her grandmother’s Holocaust tattoo—forced on her in Auschwitz—cut into a disc pendant to allow light to shine through. ​“The design was not supposed to be elegant or ostentatious,” explained Rogozinski. “I’m not trying to beautify what the number represents.” Rather, she envisions the jewelry—her line has grown to include bracelets and cuff links in addition to necklaces, with prices starting at $65 and climbing to over $2,000—as wearable symbols of resilience, love and faith.